Each of the following photos have been posted before, at different times but together they work as a bit of a theme. The lyrical quotes beneath each one do not match very well with the images but they do relate to the theme. Can you figure it out? "Come and sit by my side, if you love me. Do not hasten to bid me adieu." 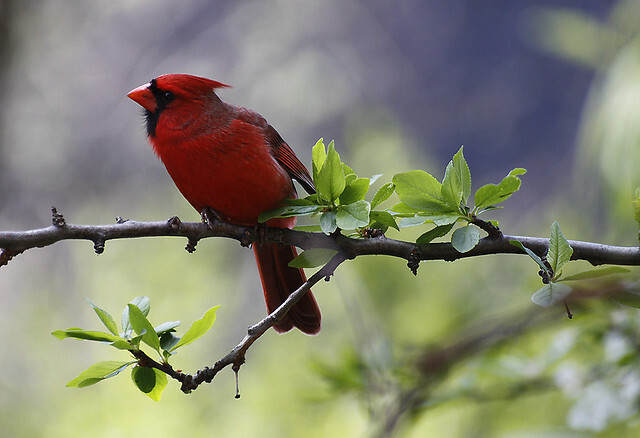 A curious but wary Cardinal watching me from the branch of a newly-budding tree. He sure seems to have personality, doesn't he? He looked into my camera in May/2010. "I was walking along, minding my business, when love came and hit me in the eye." 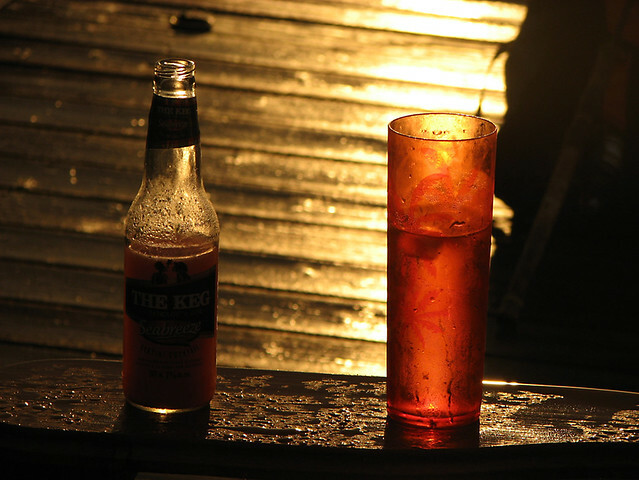 A cold drink... one summer evening... on the dock... as the sun set. Need I say more? "Look at the stars. Look how they shine for you." One afternoon, back in October, 2008, the air temperature dropped slightly. Walking away from the creek, a fine mist began to form, and drift over the path up ahead. By the time we reached the path just a few meters away, the air was filled with this golden cloud. 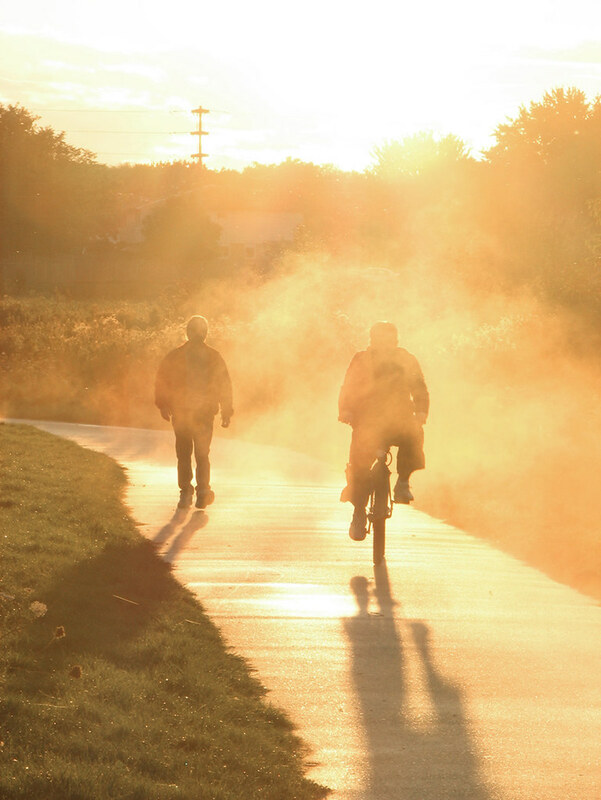 Here two people, one on bike and one on foot break through the haze. 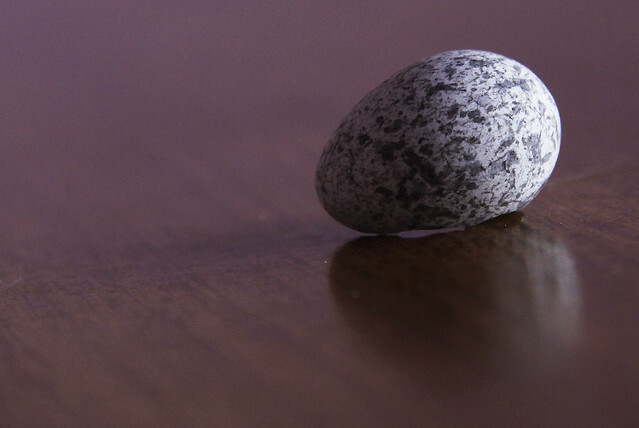 "I threw a pebble in a brook and watched the ripples run away." 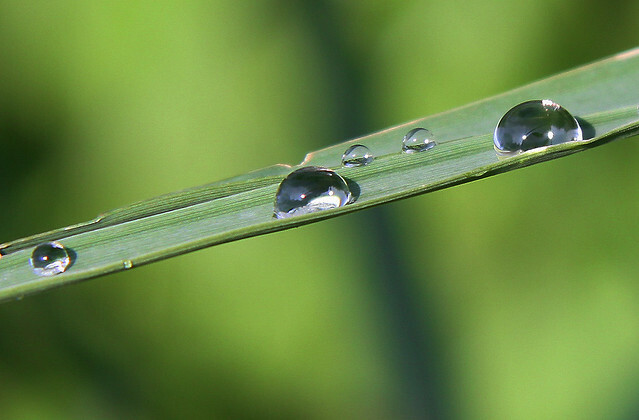 I knelt down to take this photograph of water droplets weighing heavily on an aging blade of grass in July/2009. "I feel so bad I've got a worried mind. I'm so lonesome all the time." 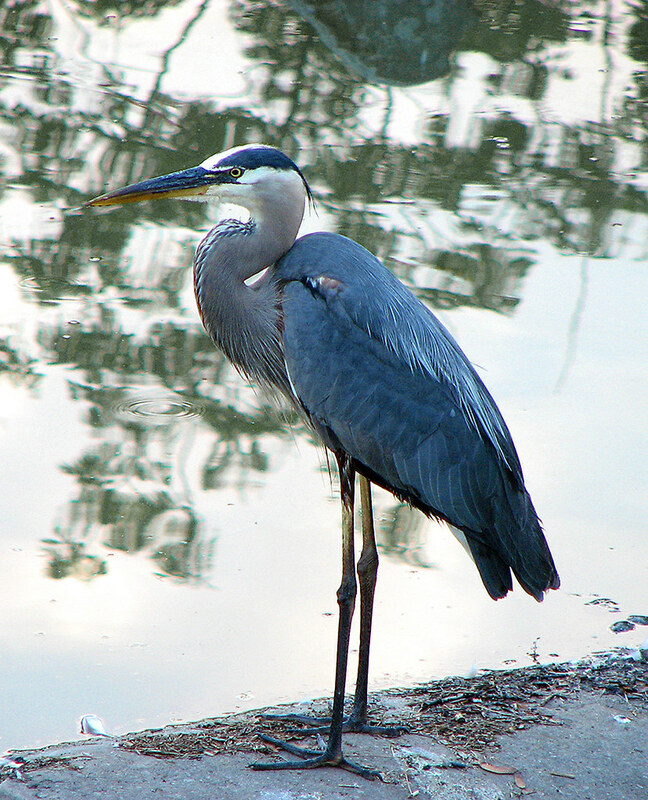 Walking around my local pond, one July day in 2008, I saw this handsome fellow hanging around the dam. He seemed quite unconcerned with my presence and allowed me to photograph him in all his majestic beauty. I hope I'll see a lot of him this year. "That feeling goes stealing down to my shoes while I just sit here and sigh." Celebratory fireworks ended an event-filled weekend in Kingston at Royal Military College on the occasion of my older son's graduation and commissioning last May. 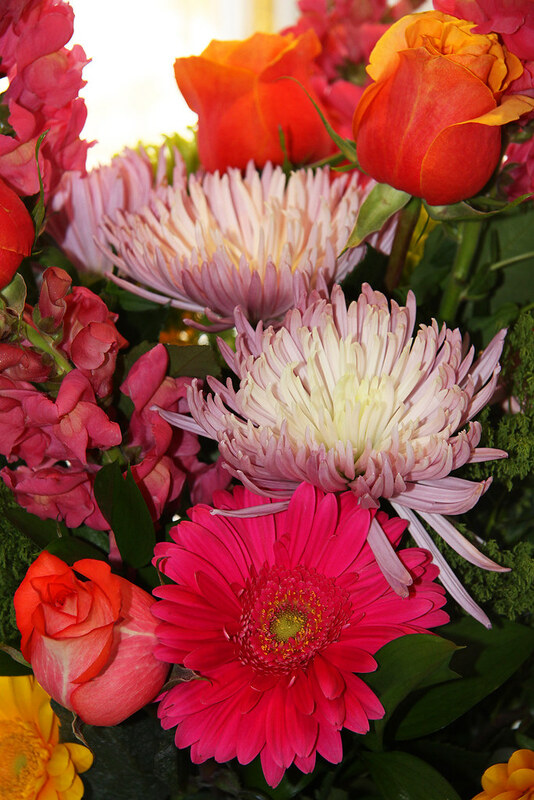 "Sweeter than the roses, covered all over from head to toe." 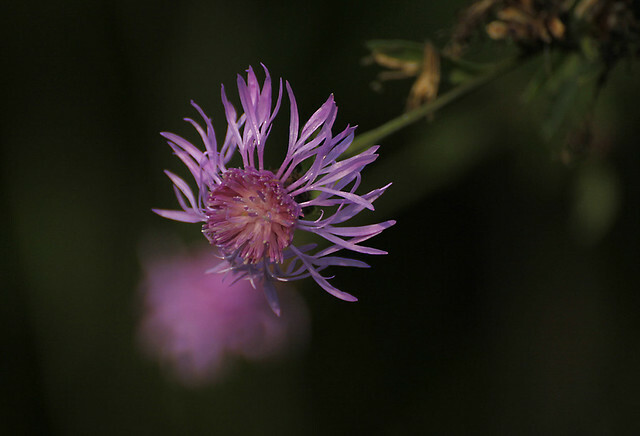 A tiny, delicate bloom, simple and pretty, caught on my camera last August. So tell me, how do my photos and quotes relate? Frozen Beauty and Posts of the Week. This image was taken earlier in the winter. 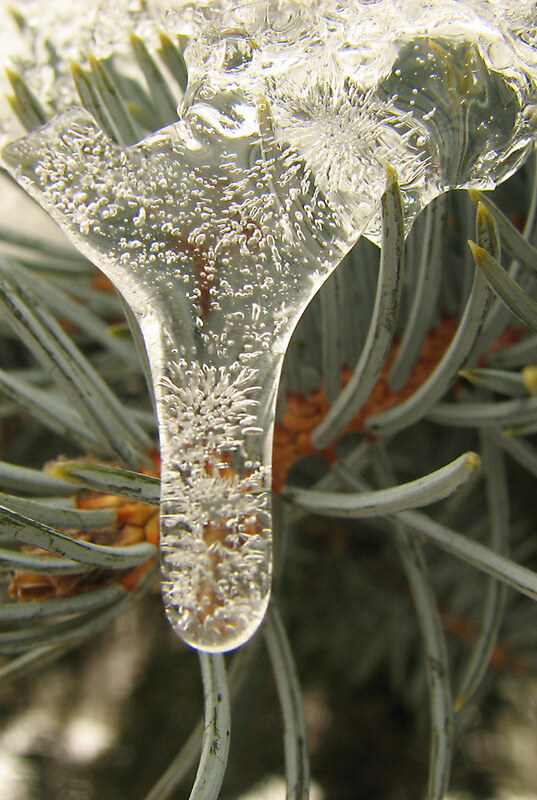 It was a rather close up view of a frozen droplet clinging to a pine tree. 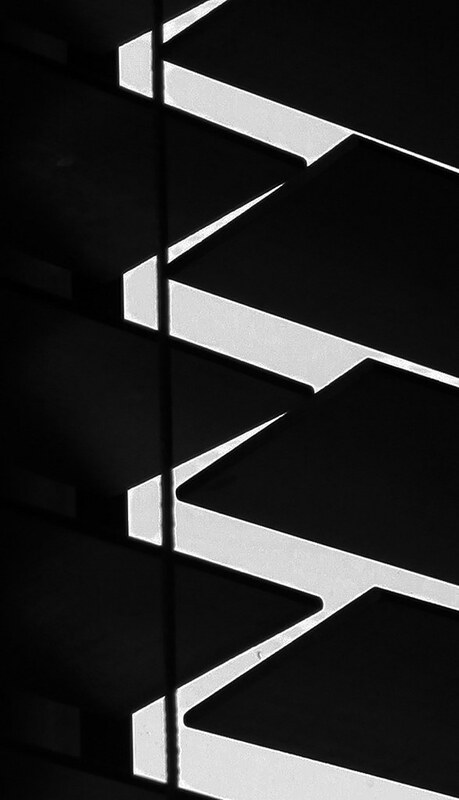 You may or may not have noticed but I didn't get around to as many blogs as usual this week, which means that there are fewer Posts of the Week than I normally list. For that reason, I haven't selected one as the top post, this week. Consider them all winners! I have a few photos taken at different times, of various people which focus on something other than their faces. Some have been posted before. Others have not. I thought they might make an interesting collection. Of course, that's all in the eye of the beholder, so I hope YOU enjoy them. My beautiful little neighbour - only days old. 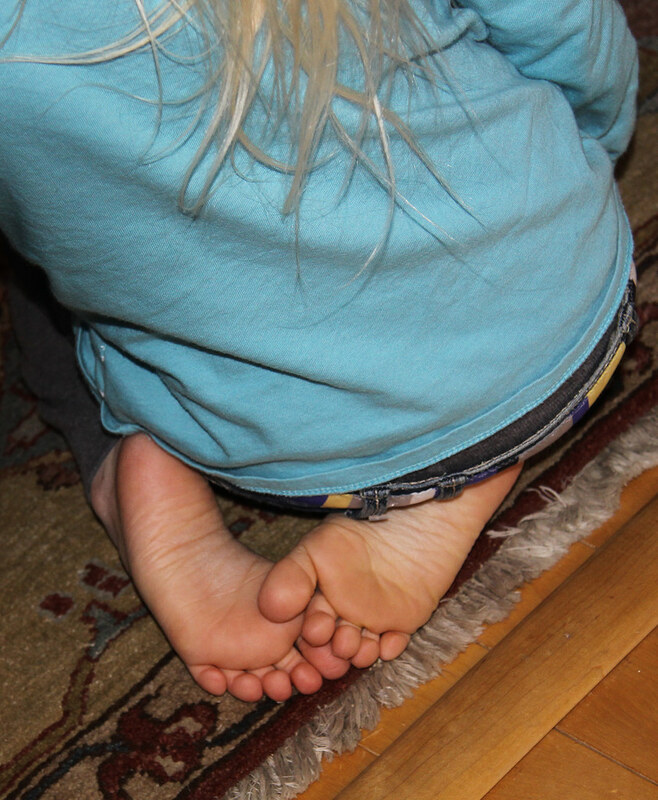 These darling feet belong to her, too. This is my son driving home from acquiring his G2 license earlier this month. 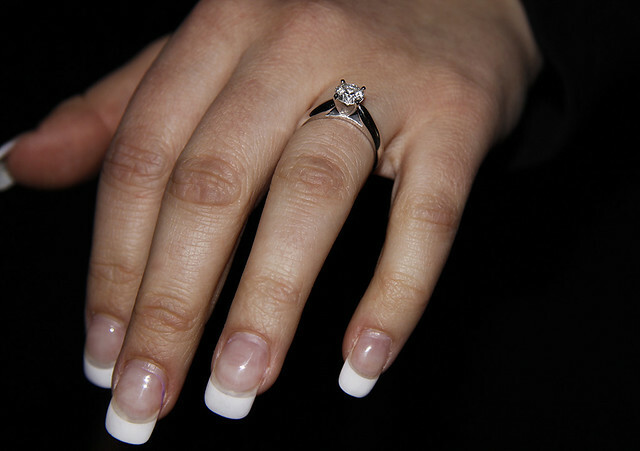 This lovely hand and ring modeled by my newly-engaged young cousin. 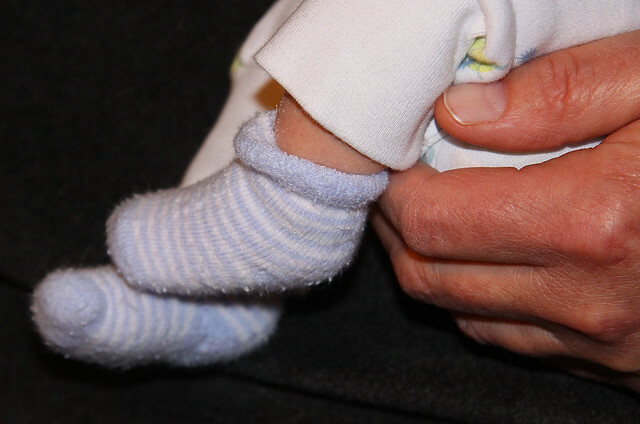 These cute little toes belong to another, younger cousin. 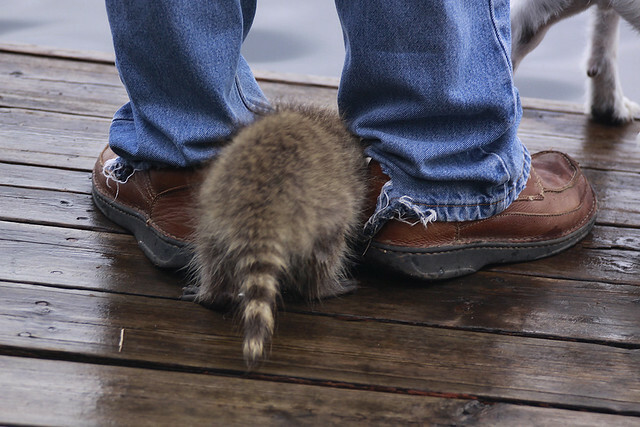 The tail is attached to Binky. Half wild, half pet, totally adorable. 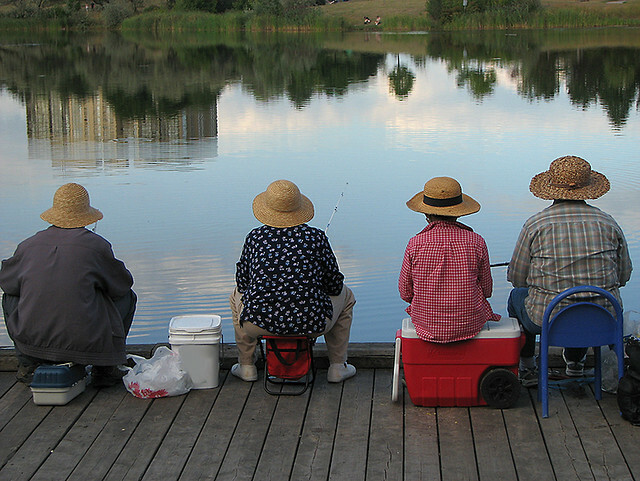 One summer evening, a few years back, I was walking around a local park and spotted this group fishing off of the dock. I couldn't resist snapping a shot. It's still a favourite of mine. I hope you enjoyed my faceless portraits. 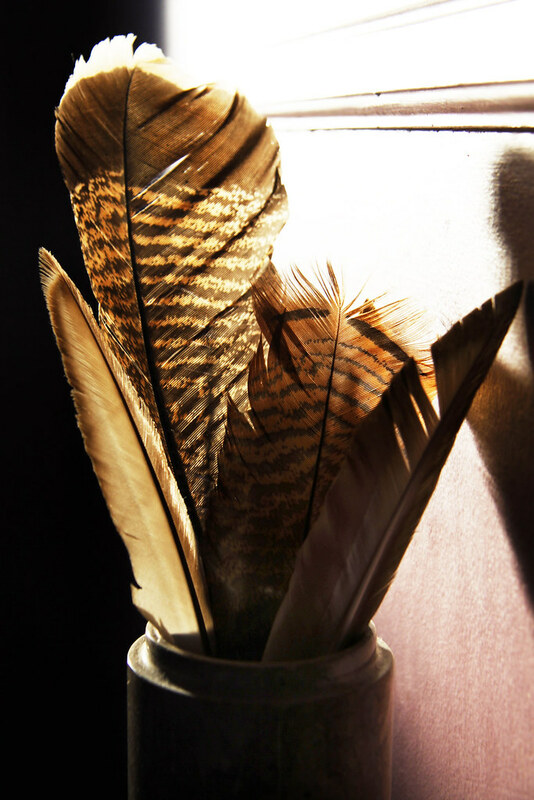 I have small collections of feathers here and there throughout the house. This grouping sits upon a table in my front hall. The morning sunlight was streaming though the front door, highlighting their colours and markings. 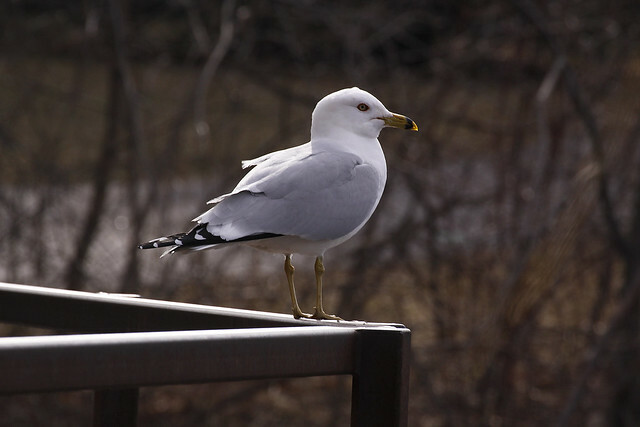 This lovely creature posed nicely for me before taking off to soar overhead, circling the pond. 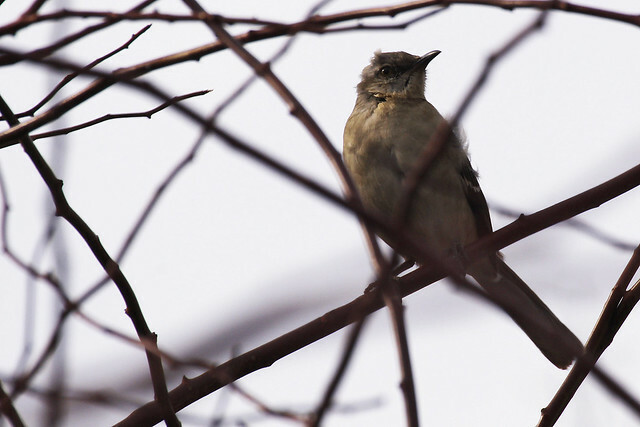 My friend, the Northern Mockingbird. I don't see him often but he has a way of appearing just when I expect him to. Isn't that accommodating of him? 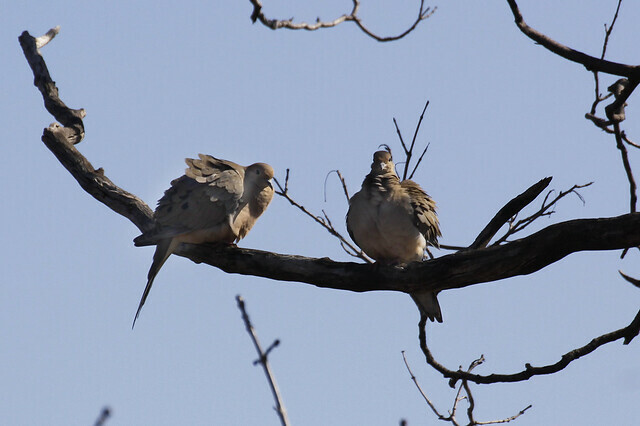 Looking up, as I often do, I saw these mourning doves peering back down at me. They're not the brightest birds in the flock but they sure are lovely. I came home from my walk around the pond and glanced at a low branch of the pine tree which overpowers my small front yard. 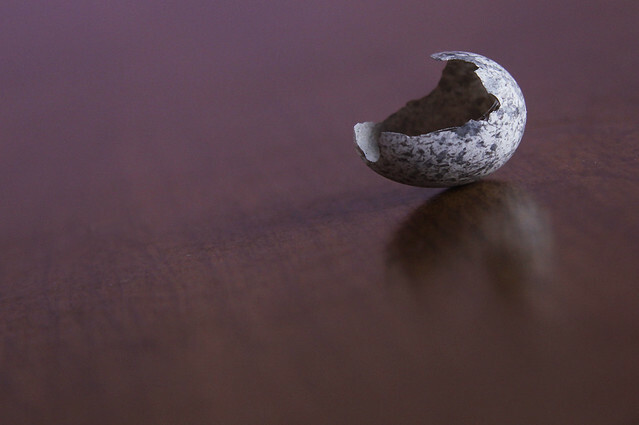 Perched ever so delicately was this small, vacated sparrow egg. It seems early for new hatchlings and I wonder if it's a leftover from last year. Turning it over, you can see where the wee sparrow made its exit. These photos were taken a few days ago when spring was in full swing. If you'd look outside my door today, you'd see a fresh blanket of snow covering the previously thawed earth. It fell all day long. Enough! No photos today but I do have an incredibly touching, heart-tugging and inspiring video for you. You might want to grab a tissue first. Thanks, Frank for sending it my way. More inspiring posts can be found under the appropriate header below. Today's POTW would be classified as funny crazy hilarious. Heed the warning that the title suggests, guys - lest you blush. Enter at your own risk. 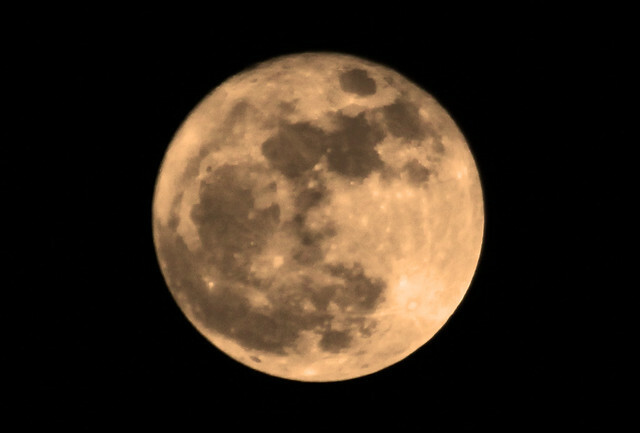 Last night's full moon was a super perigee moon. 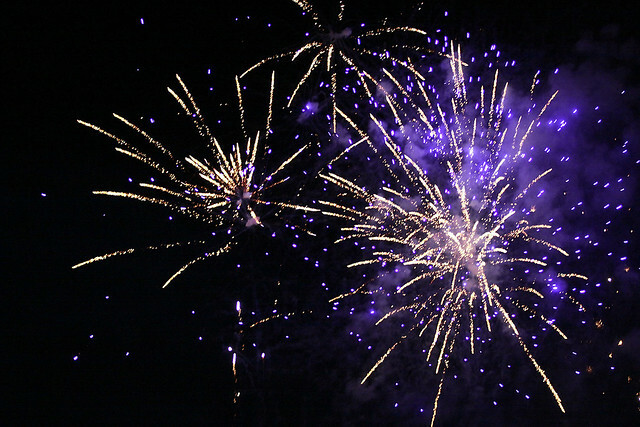 It appeared bigger and brighter as it traveled closer to Earth than usual. If you're interested in reading about this event which last happened in 1993, you can find some information here. If you just want to see some photos, read some quotes and a bit of my blather, skip that link and just scroll down. 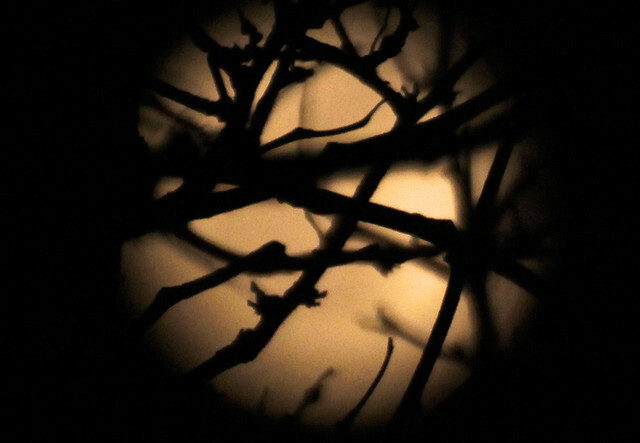 Awaiting the full moon, I sat atop a picnic table in the park and snapped a few photos of my surroundings. 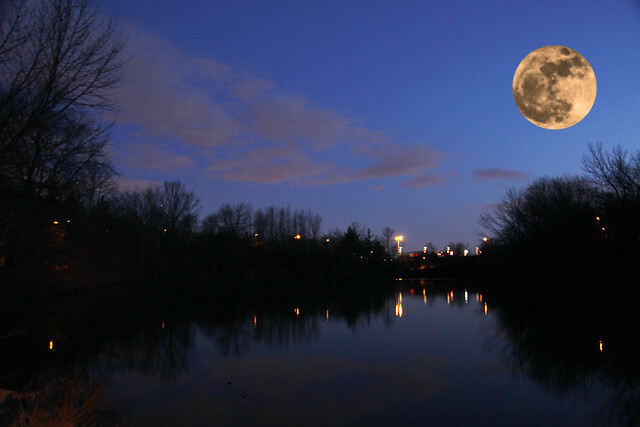 The view is of my local pond. 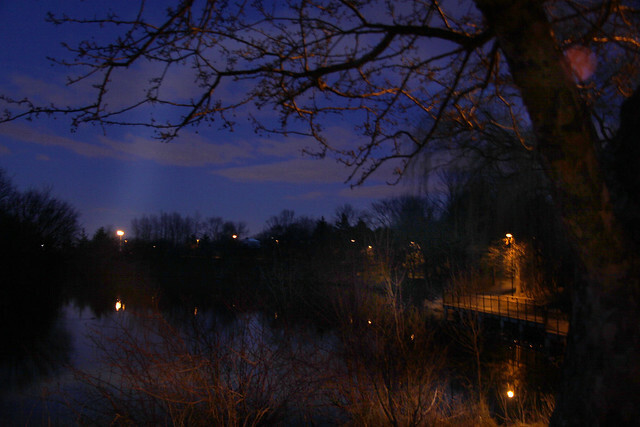 To the right is the dock, well lit by lamp posts all along the path. 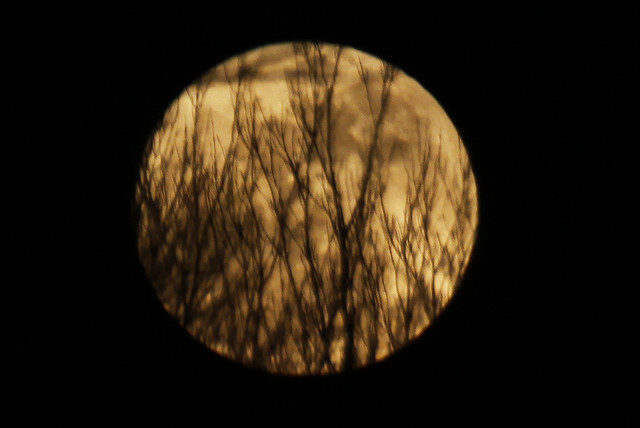 When the moon did rise, my view from just about anywhere in the park was obstructed by trees. They made for some interesting images though. You can see that the trees are beginning to bud. 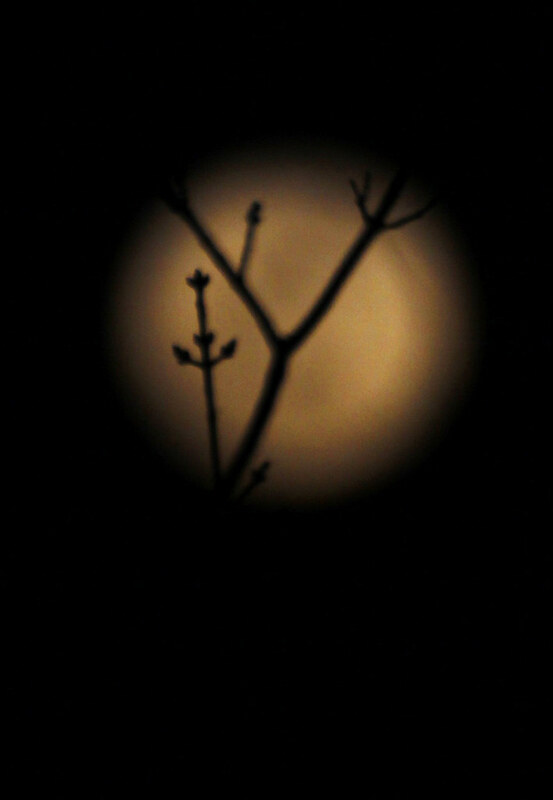 The moon is totally out of focus here, but I thought the budding twigs looked elegant. My son liked this one and said he could see putting it on a metal music album cover. ... except in Photoshop. 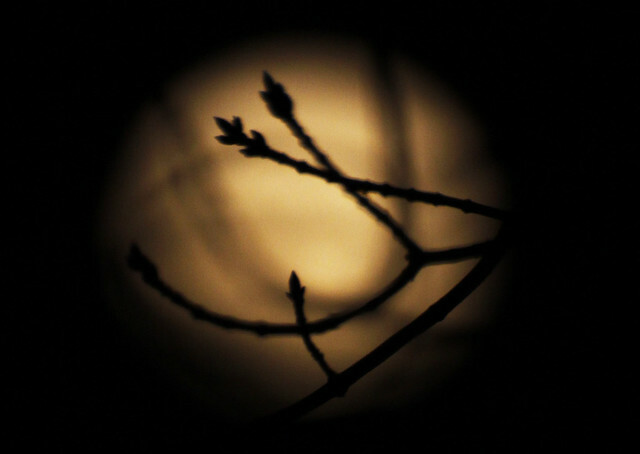 It's fun to play with the moon in my hand. This beautiful face belongs to my sons' Great Aunt Lois. She's their father's late mother's sister. The faraway look in her eye reflects the bewildered pleasure she felt at having received a special phone call just moments earlier. This past Sunday was a special occasion - Aunt Lois' 95th birthday. Go on, you can say it. She looks much younger than that. She's young at heart, mind and spirit too. 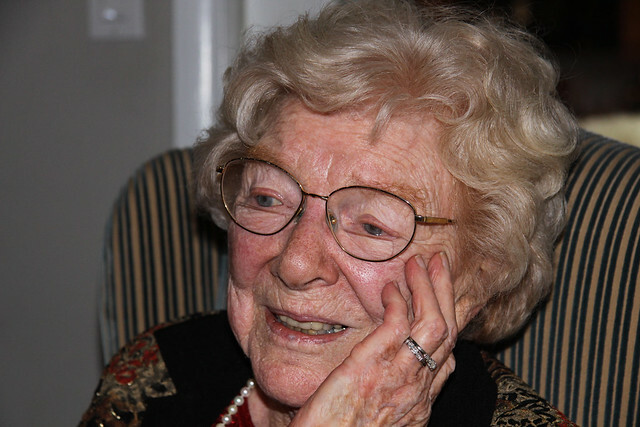 In earlier years, Lois was a public health nurse right here in Mississauga, and among her duties were postnatal visits to mothers and their babies in the home. One such visit was to a woman just five years her junior, a new mother named Hazel McCallion who has since held the title of Mayor of Mississauga for the last 32 years. Well, I'm sure you've guessed by now that it was Mayor Hazel on the other end of that phone, calling to congratulate her on her birthday. 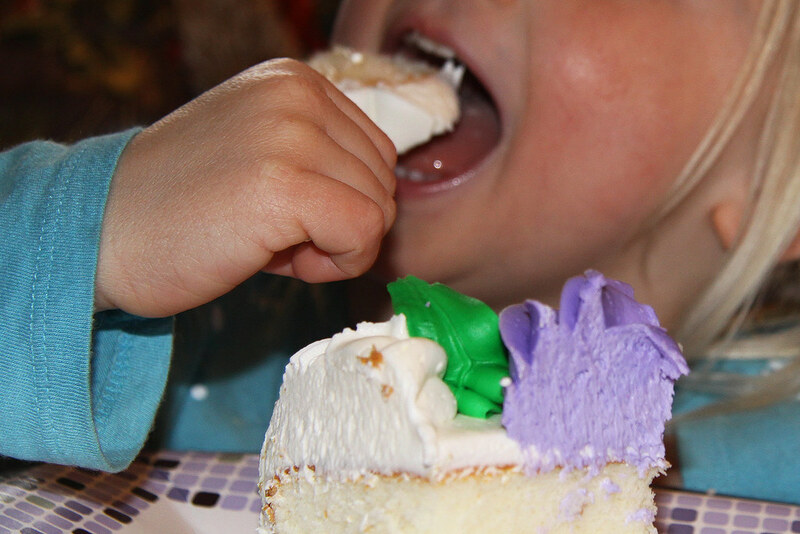 As it turned out, it was supposed to be an in-person visit, arranged by Lois' granddaughter Amanda and grandson-in-law Colin who were hosting the party. 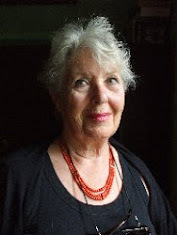 Hazel was planning to attend but was detained at an earlier commitment and opted to call and arrange an afternoon tea at Lois' retirement home sometime this week instead. Aunt Lois was delightfully stunned by the incident. I'm not sure if the mayor actually remembers Lois - it's not like they've ever been in touch since they met over 50 years ago, but Hazel was touched by Amanda and Colin's desire to do something memorable for Aunt Lois and excitedly agreed to meet with her. 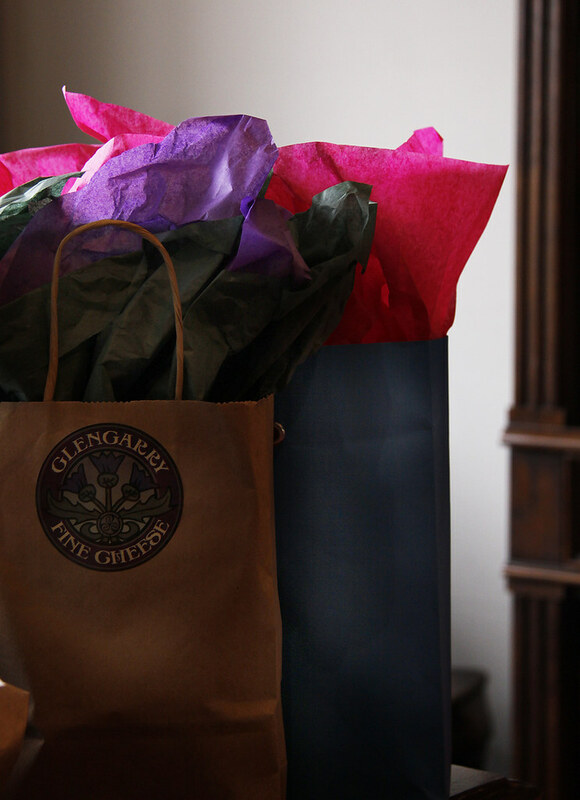 It's unfortunate that she wasn't able to make it to the party as it would have been a wonderful surprise, but it's nice to know that she cared to make the phone call and plan an an afternoon tea with her. 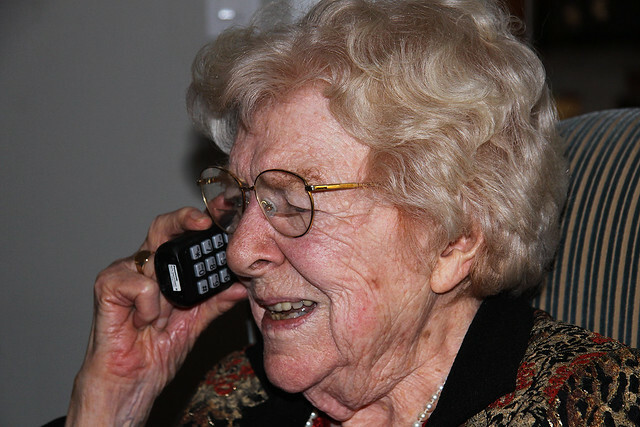 When the brief phone call was over, Aunt Lois was so pleased, and she expressed how much she was looking forward to meeting with the mayor. What I found to be particularly touching was how Aunt Lois immediately thought about her late husband. "Reg would have just loved this." The party was a fine celebration as most birthdays are. 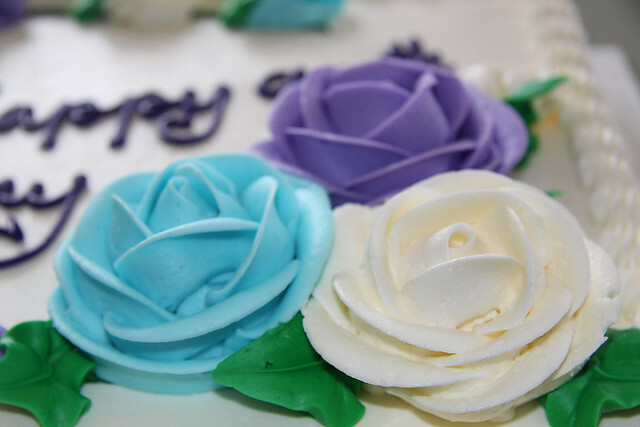 And flowers on the cake. And there was lots of love. 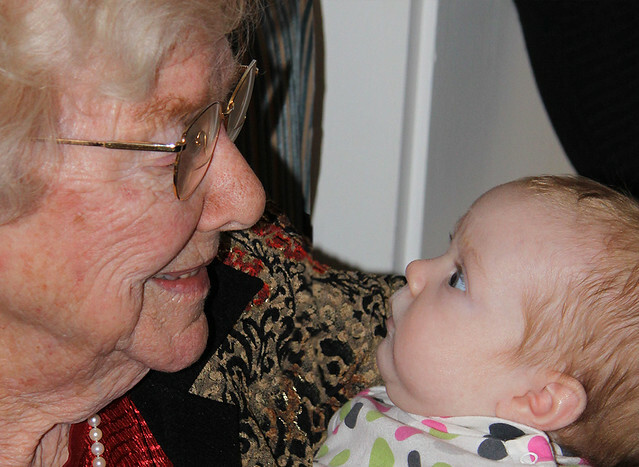 This is Aunt Lois with her youngest great granddaughter, Maeve. Aren't they a beautiful pair? 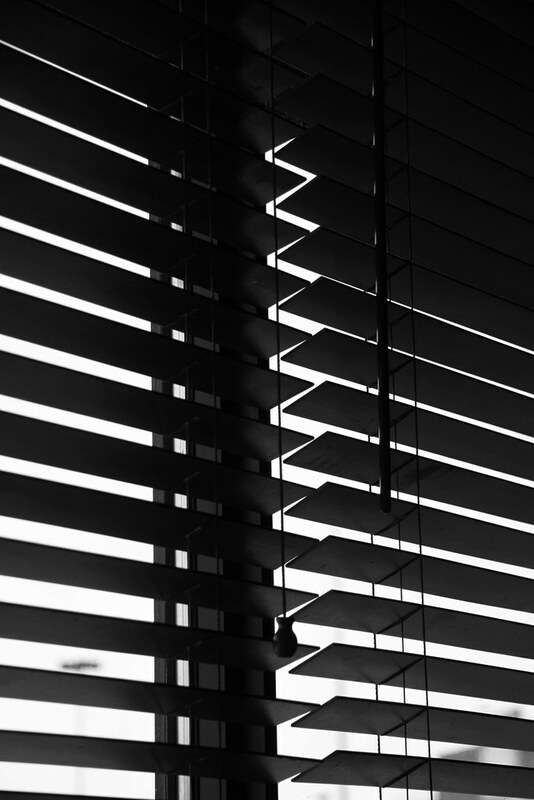 The mystery image in yesterday's post was of Venetian blinds seen at a restaurant. All comments have now been posted so you can see how everyone did. The full image appears below. All of you who guessed had clever answers but the correct ones were give by Glo, Zuzana, June, Sandra, Daryl, Fragrant Liar, Steve (Out on the Prairie), Kat, Reb and Cricket. The mystery image above was taken a few days ago. It's either going to be really obvious or it might possibly have you stumped. I'm going to moderate comments just for today. See if you can guess what the mystery image is. I'll post the answer tomorrow.